Cutie Mark: Discord is not a pony. Special Somepony: His one true love...causing chaos and misfortune for ponies everywhere. Residence: No where yet everywhere. Workplace: Job is causing chaos where ever he is rather it be for the purpose of good or his own evil desires. Short Introduction: I am Discord the Spirit of Disharmony your misfortune is my fortune. I love causing havoc where ever I go. Backstory: Discord once ruled over Equestria in a state of unrest and unhappiness, until Princess Celestia And Princess Luna used the elements of harmony to end his rule and turning him to a stone statue to protect the lives of the other ponies he tormented. Discord later broke free due to the sisters no longer being in touch with the elements and he would hide the elements of harmony and once again through equestria into a world of chaos as he turned the mane 6 against each other. Later he would be defeated once again and turned back to a statue after wards he would later be freed by Celestia and "befriend" Fluttershy in doing so he pledge most of the time he would use is powers of chaos for good instead of evil. Apearance: His head is horse-like and he has a deer antler on the right, a blue goat horn on the left, one long fang, different-sized pupils, a snake tongue, a goat beard, and white bushy eyebrows. He has the right arm of a lion, the left claw of an eagle, the right leg of a lizard, and the left leg of a goat. In addition, he has a bat's right wing, a Pegasus' left wing, a horse's mane and a dragon-like snake's tail with a white tail tuft. The shape of his body resembles that of a snake. 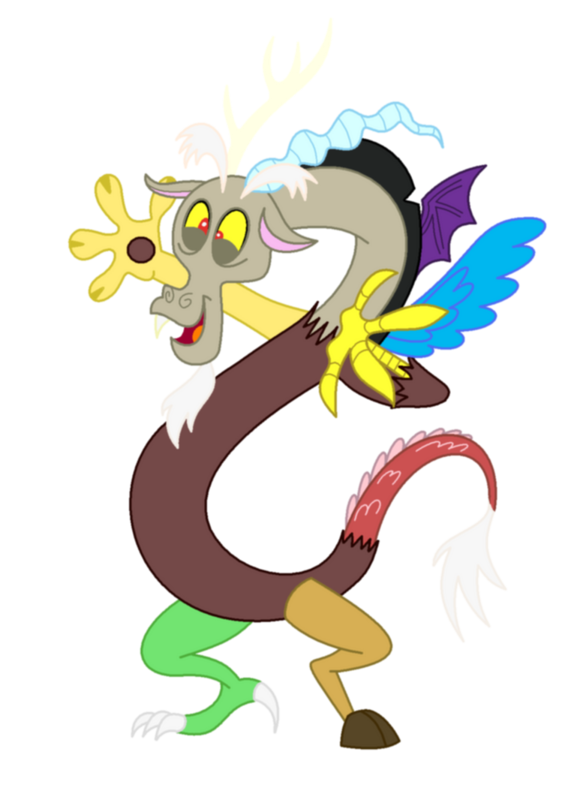 Personality: Discord likes to torment creatures especially ponies by reversing the laws of physics and making abnormalities occur. Even though he promised Princess Celestia that he would reform his ways he still prefers to cause misfortunes to others. Equestria RP Alts: I RP Glacial Mist as aproved and also currently I RP Shadling quite often. Sample Post:Discord could be heard laughing, but was unseen as pones everywhere scattered and trembled under the tables outside near Sugar Cube corner. A white cloud of smoke formed near the door to the shop soon the smoke vanished slowly as Discord walked out of it with a grin. Discord looked around and opened his arms widely and said, "Well hello there, every pony! Don't mind me I am just here for a little shopping!" Discord said as he waved his right paw and a bag appeared as he turned around and pushed the door opened and floated inside it closing the door behind him. The Cakes turned to greet the new customer, but then started cowering as they saw Discord stride in. Discord smiled and and chuckled slightly, "Oh hello I am just here for some delicious cup cakes." Discord announced of course he could just wave his claw and have them appear his self, but where the fun in that when he could see the terrified faces of all his little pony friends. The Cakes gulped and nodded as Mrs. Cake with trembling hooves walked over to the glass case and took the bag from Discord and started to fill it completely up. Discord smiles and acted like he was reaching for a pocket to get money, but then sighed, "Oh dear I seem to left my money else where mind if I pay you later for these?" The Cakes nodded and trembled, "Th-they're free." They both said in unison. Discord grinned wider, "Oh why thank you how kind." He chuckled as he scooped up the bag and disappeared in a puff of white smoke leaving his mouth behind lastly as it said, "I bid ya both a due." Then the mouth disappeared.